I’m still digesting all that I heard at the 5th WCILCOS conference and cogitating about the exciting possibilities for international collaborative work that have emerged from it. I’m hoping to pull together some more thoughts about my discussions with folk from Canada and the US about mixed-race overseas Chinese families and children. In the mean time, though, here are the slides of my talk and the first (and much longer) version of the paper I wrote a couple of months ago: Paper trails: Anglo-Chinese Australians and the White Australia Policy (pdf, 1.9mb). A little article of mine* appears in issue 9 of Inside History magazine (March–April 2012). 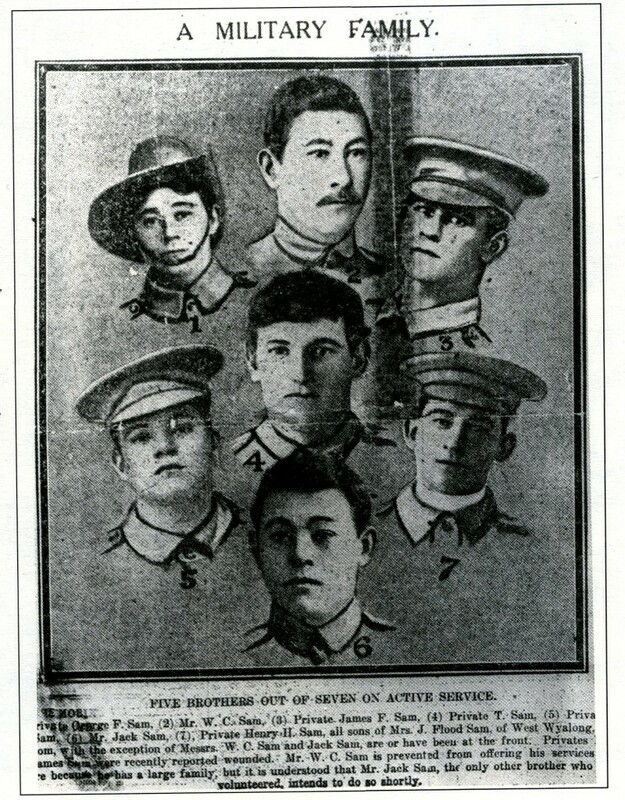 The article discusses the experiences of Chinese Australians during World War I through the experiences of the Sam family from West Wyalong, New South Wales. I first came across the Sam family in the file of youngest son, Percy, who travelled with his father to China in 1915. It was noted in their applications for exemption from the Dictation Test that a number of Percy’s brothers were serving in the First AIF – they were, in fact, at Gallipoli. It seemed such an irony that at the same time as his brothers were fighting for their country overseas, Percy was made to comply with the regulations of the Immigration Restriction Act, something that suggested he was less than a true Australian. The way that Chinese Australians were treated during World War I was full of contradictions. Some young men were able to enlist, others weren’t. I don’t mention it in the article, but Chinese nationals were required to register as aliens during wartime (and afterwards) – so there were also cases of Chinese fathers having to report to the police to register as aliens while their Australian-born sons were away fighting for country and empire. Unfortunately, I can’t provide a link to an online copy of the article, so if you’re interested you might just have to go and buy a copy of the magazine. * Kate Bagnall, ‘That famous fighting family’, Inside History, issue 9, March–April 2012, pp. 37–40. In October 1913 Secretary of the Department of External Affairs, Atlee Hunt, sent a circular to the state Customs departments asking if they kept records of Chinese Australians who used their birth certificates as identity papers when travelling overseas. An example of the early difficulties that both Chinese Australians and government officials had with using birth certificates as identification can be found in the case of Fred Hong See (see NAA: BP342/1, 13021/357/1903). Fred was born in Sydney in 1885 to Chinese parents who, when he was very young, took their son back to China. Fred’s father later died and, in 1903, Fred returned to live with other relatives in Sydney. When he arrived, Customs officer J.T.T. Donohoe doubted his identity and would not allow him to land. Donohoe’s suspicions were based on the fact that Fred could not speak any English and his feeling that Fred looked older than the age stated on the birth certificate he presented. Fred was quickly sent on his way back to China, and it was only through the threat of legal action by his well-respected relatives in Sydney and their payment of a deposit of £100 that Fred was permitted to stop at Brisbane for re-examination. With evidence provided by Fred’s relatives, the Brisbane Collector of Customs, W.H. Irving, was satisfied that he was, in fact, telling the truth. After Atlee Hunt’s approval, Fred was allowed to stay. 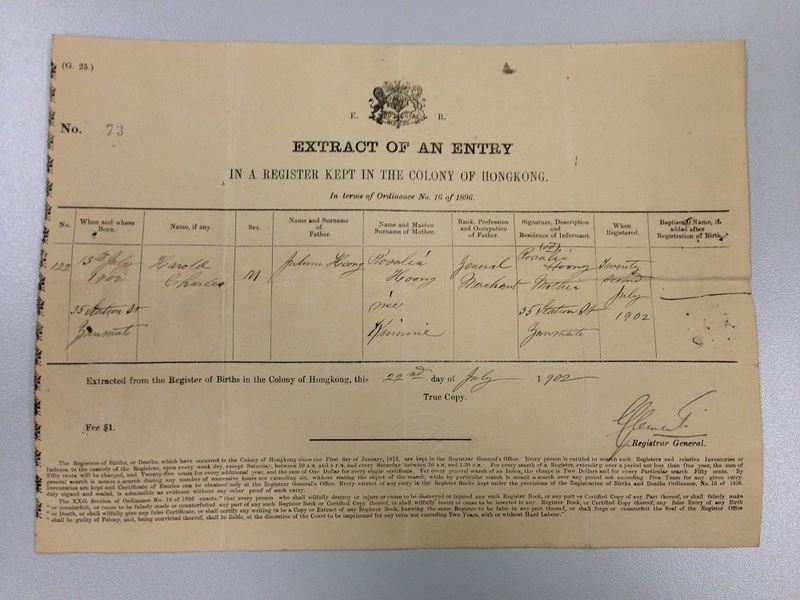 This is the copy of Fred Hong See’s birth certificate that he presented to officials on his return to Australia in 1903. It can be found with other correspondence about the case in NAA: BP342/1, 13021/357/1903. Victoria reported that had been keeping a register from the beginning of the year (1913), but without the level of detail requested. New South Wales had not been keeping records, but was now ordering a book for the purpose. Western Australia had no special register, but would immediately open one. South Australia said they had not had any need for a register, as there had been no cases of Chinese being admitted on birth certificates there. Tasmania would begin keeping a record, but had only had four cases to date. And the Northern Territory had been keeping record of Chinese arriving on birth certificates since 1911. It became the practice for birth certificates to be endorsed by Customs officials on a person’s departure. This usually included taking a handprint and attaching a photograph, as well as recording the details in a register. Some people also went through the formality of applying for a CEDT. The first volume, of 16 double pages, has suffered flood damage and can be difficult to read in parts. The second volume, which has 23 double pages, is much more legible. A sample page from the second volume is shown below – this is a left-hand page, with the remainder of the details about each person completed on the corresponding right-hand page. The page reproduced below is a left-hand page, with further details about the travels of each person available on the corresponding right-hand page. 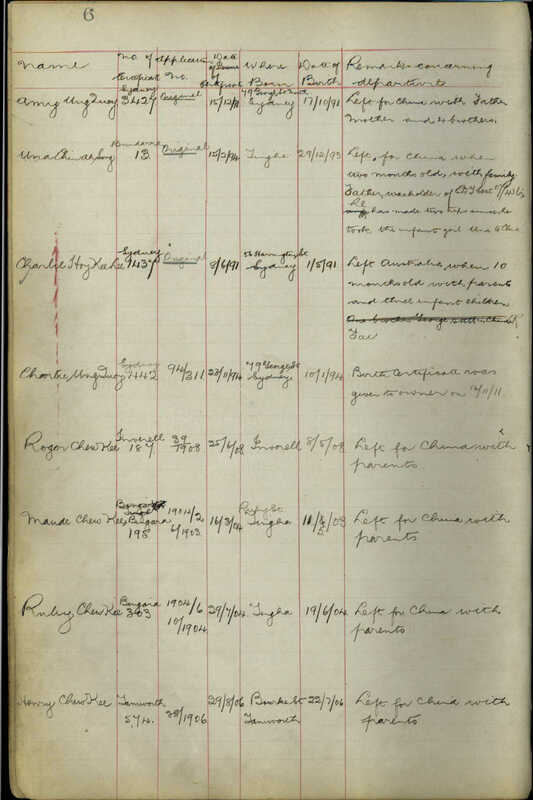 These registers are valuable sources of information about Chinese Australian families in Queensland and New South Wales, and can provide missing pieces of information for people who did not apply for CEDTs when they travelled overseas (which many Australian-born Chinese did not). 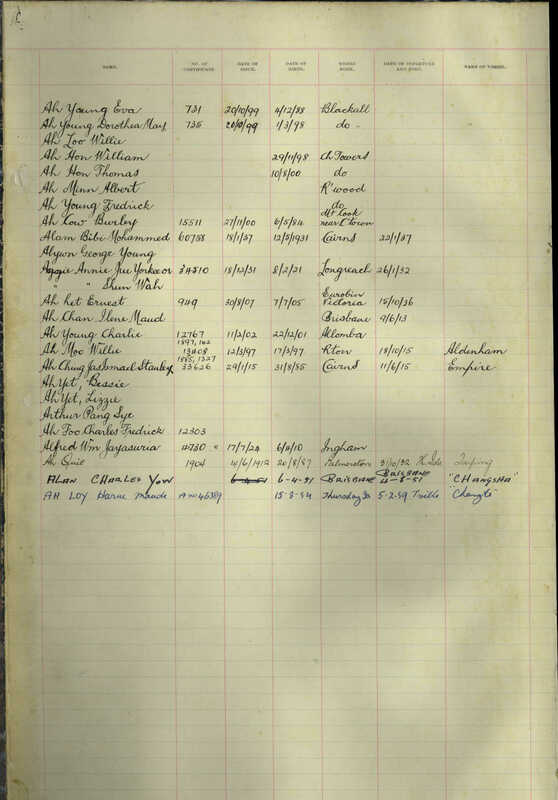 Having them digitised is great, especially for those of us who can’t easily get to the Brisbane or Sydney reading rooms – but what would be even more useful is if the information contained in the registers was in a form that could be searched and sorted. I’m working on a bigger project relating to Chinese families in New South Wales, based around a database of information sourced from marriage and birth records up to 1918. I’m part-way into transcribing relevant details from the published BDM indexes with 1000 entries (out of an estimated 3000–4000) in the database so far! The information found in the birth certificate registers obviously relates very strongly to this, so I have another crazy plan to also transcribe the information held in the Sydney register. It’s not going to be a quick job – and it’s one that could easily be shared since the New South Wales register is online. So, if you happen to have some spare time and don’t mind deciphering old handwriting, I’d love to hear from you! This is the first in a series of five posts that looks at the different iterations of Form 21 over the first decade of the 20th century. Form 21 is better known as a Certificate of Domicile or Certificate Exempting from Dictation Test (CEDT), but there is something reassuringly bureaucratic in it having a number. There is something practical in it too, because there were a bevy of other forms as well (32, 22, 19, 9 etc), including the confusion-causing Certificate of Exemption (Form 2, which was a temporary entry permit rather than a re-entry permit). I have located what I’m fairly confident are the first examples of each variation of Form 21 between 1902, when the Immigration Restriction Act came into effect, and 1908. After then things settled down a bit and the form remained more or less the same over the following decades. My examples are taken from New South Wales. You can see these examples and others in my Invisible Australians library in Zotero. The first Certificate of Domicile issued in New South Wales would have been numbered 02/1 – ’02′ being the year 1902 and ’1′ being the certificate number. There is a volume of certificates from 1902 in NAA: SP11/6, Box 3 (more about this in an earlier post), and my guess is that the first Certificate of Domicile is probably to be found there. Unfortunately it’s not digitised and I’m not in Sydney, so we’ll have to leave confirmation of that ’til a later time. The certificate was issued in the name of Ah Shooey, a 47-year-old Chinese man from Canton, who was departing Sydney for China on the Kasuga Maru on 1 January 1903. The certificate notes that Ah Shooey has one son, who is accompanying him. This is presumably 22-year-old labourer Louey Back Keong, whose certificate is no. 03/2. Two copies of the form were completed; the one pictured above includes the word ‘Duplicate’ handwritten in red on the front. This copy was kept on file in Sydney, while the other copy (also found in NAA: ST84/1, 1903/1-10) would have been given to Ah Shooey to use during his travels, before being collected and filed on his return. Details of Ah Shooey’s arrival were also marked on the used certificate (‘Landed Empire 27/05/05′). Immigration Restriction Act 1901 and Regulations. I, Nicholas Lockyer Collector of Customs at the port of Sydney New South Wales in the said Commonwealth, hereby certify that Ah Shooey, hereinafter described, has satisfied me that he is domiciled in the Commonwealth, and is leaving the Commonwealth temporarily. Particular marks Nail on little finger left hand missing. Top of third finger on right hand off from first joint. References in Australia (names and addresses) Police Magistrate Deniliquin. A Fordham Deniliquin. C Hitchin Jerilderie. On the reverse, the form includes the words ‘Impression of Left Hand’ and Ah Shooey’s handprint. This blog pulls together posts about Invisible Australians from this site and our personal blogs.